7CPC: 7th Central Pay Commission for Central Government Employees: 7th Pay Commission: Why government not to implement higher allowances? 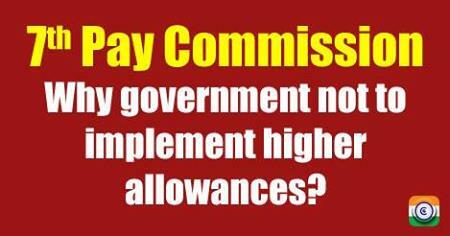 7th Pay Commission: Why government not to implement higher allowances? New Delhi: Despite all that has been said about the higher allowances under the 7th Pay Commission recommendations, an important issue for central government employees has now been strangely absent from the government agenda. First, the Finance Minister Arun Jaitley had claimed it must implement after four months of the basic pay hike but it failed to come true. More than 14 to 15 months have passed since the 7th pay commission report was submitted and seven months have elapsed since the union cabinet approved the 7th Pay Commission recommendations for salary hike of central government employees, but the they are still awaiting the higher allowances. The government has given higher basic pay in August 2016 with arrears, effective from January 1, 2016 to its employees on the recommendations of the 7th pay commission but the hike in allowances other than dearness allowance referred to the 'Committee on Allowances' headed by the Finance Secretary Ashok Lavasa for examination as the pay commission had recommended of abolishing 51 allowances and subsuming 37 others out of 196 allowances. Accordingly, existing allowances are now paid to the central government employees according to the 6th Pay Commission recommendations until issuing of higher allowances notification. Finance Secretary Ashok Lavasa said in October 2016, "We are ready to submit our report, when the Finance Minister Arun Jaitley calls up." But the government gave extension to the committee up to February 22, 2017 on the pretext of demonetisation and the government said that the cash crunch was the reason behind the delay in announcing higher allowances. The announcement of assembly elections in five states has given an excuse for the government as it cannot announce pay hikes till the model code of conduct is in place up to March 8. The government is using delaying tactics to save the government money to pay higher allowances without arrears from August 16. The delay in implementation of the higher allowances has caused tremendous irritation and frustration among employees. The Prime Minister Narendra Modi led BJP may have to face a backlash in the assembly elections in the five states, two of which is ruled by the party either directly or in alliance. Thus, not properly implementing of the 7th Pay Commission recommendations would amount to strike to blow to the BJP in polls.